A full slate of All Star Rugby action was on at the Aurora Sports Park yesterday. 22 select sides competed the pill in three divisions: Varsity Boys, Girls, and Junior Varsity Boys. 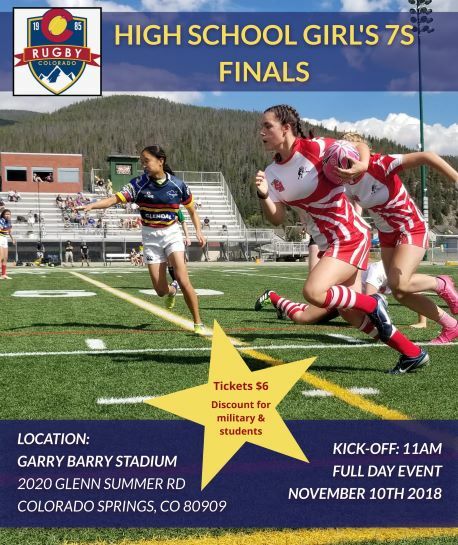 Rugby Colorado sides ran the gamut from top end with the Varsity XV going undefeated Saturday, while Girls and JV teams will both be seeking initial victory today. Utah Varsity topped Oklahoma, 15-6, in the opening round and worked Wisconsin to the tune of 39-14 in the second match, while Texas toasted Idaho, 43-nil, for their first win and then popped Nebraska, 43-5, for their next triumph - the emerging men from the Lone Star State looking quite the business now. An attempted counter by the Exiles of a Rugby Colorado (RC) territorial question went wrong when the Centennial State’s inside center, Fort Collins Rugby’s Devon Worrell, intercepted a pass and made ground before offloading to his center partner, Aurora Saracens Will Fifita, who crossed for the try and Colorado were up, 5-0, in the third minute. Colorado extended its lead with a corner cross-and-grounding by flyer Sam Ross of Chaparral Rugby; 10-nil the feed after 8 minutes. A penalty awarded the RC by referee, Brighton Khumalo, ten meters from goal, quickly tapped, and a slicing incursion by openside flanker, Regis Jesuit’s Donovan Ronin, enabled the speedster’s fiver and increased the advantage to 15 just past the midpoint in the first half. Mr. Ronin was also featuring well in the acquisition of lineout ball, and Colorado were winning the breakdown battle thus plenty of possession, their subsequent prize. Colorado dotted a brace of scores to open the second stanza with Fifita grounding after a lengthy, ranging gallop of 50 meters (converted by Colorado Springs Grizzlies tighthead prop, Caoibhin “Vinnie” Falvey) and a try scored after the pack filched an Exile put and Ronin’s twin, blindside Logan, slipped through the defense for a 15 meter scamper yielded a scoreline of 27-nil midway through the session. Louisiana were to find joy in a 40 meter scoot by halfback, Joe Garcia, whose dipping, swervy maneuverings flummoxed RC’s defense and resulted in final record of 27-5 for Colorado at Khumalo’s last blast. Heart of America opened up the scoring in a big way: flyhalf Jake Bergner’s perfect offload at tackle to outside center, Sam Chapman, put #13 clear at Colorado’s 22 meter line for a straight scoot for goal and the touch down, followed by his own conversion, had Heart up 7-nil in the early goings. Colorado responded with a concerted effort in the business district, multiple pick-and-goes by the forwards crabbing across the field within that ten meter expanse fronting goal, before standoff Keegan Anderson scooped ball from breakdown and darted into goal for the grounding and Colorado edged closer, now 5-7, with nine minutes gone off referee Nick Senorov’s timepiece. A quickly-tapped penalty and the long sling out to three-quarters Sam Ross, and that fast flyer’s finish, put Colorado in the lead, 10-7, at minute 17. RC extended its advantage right prior to the half when fullback Jake Gentry burst to space at his own ten meter line and outpaced the chase for his grounding converted by lock, Rob Hiles: 17-7 for Colorado at the half. An offensively-applied tackle meant a jouncing pill and flyhalf Keegan Anderson’s stylish gather in the business district before that #10’s dot and Hiles’ added deuce; 24-7 for RC 10 minutes into the last period. And NOW came the boys from the nation’s midsection! Chapman fired up his mates with a jinky, rambling counter through Colorado’s centerfield for fifty meters; his cross-and-ground and blindside flanker Eli Aiono’s sticksplitting completion meant for a 24-14 scoreline with time winding down. Heart would tighten things up considerably when their tighthead bulled his way into goal for Aiono’s conversion and tallies at 24-21 to RC just now with just a couple left on the clock. … as an RC boot for touch and the victory went awry and into the Colorado Promised Land, subsequented by an apparent grounding by a Heart of America player; but the pill was judged to have been handled forward in the process and a knock-on decreed, ending the feistive [sic] match with a record of 24-21 to Colorado at Senorov’s final signal.